Establishing a business in China is a challenging prospect. The competitive environment with the state-supported industries is tough. Plus, the business environment for Western-based companies is different from the typical international climate encountered elsewhere. You need a consulting firm already located in China to help you navigate the complex Chinese business system. This legal structure is unique and dynamic with various business models to analyze before making a commitment. You may even want to pursue a graduated business model approach given that Chinese business law is not mature and is subject to rapid change from year to year. City, province, and local variations make it even more challenging. There are four primary structures to consider: the Wholly Foreign Owned Enterprise (WFOE), Sales Office/Labor Dispatch Model (LD), Joint Venture (JV) and, the Representative Office (RO). Each model has its distinct advantages and disadvantages making it imperative that you adopt a walk before you run mentality and even consider a business strategy that moves from simple to more complex until you reach your desired level of involvement as a risk mitigation technique. Awareness and preparation are essential to minimizing the time and cost and avoiding unnecessary delays in getting your business established. Have your consulting firm in China pay attention to the current news and policy changes of the Chinese government. Web sites such as the State Council of the People’s Republic of China offer an up to date news service on topics related to doing business in China and also provides links to other important Chinese government sources such as the Ministry of Commerce. China’s Ministry of Human Resources and Social Security (MOHRSS) promulgated the “Interim Regulations on Labor Dispatch” (MOHRSS Order No. 22) and came into force on March 1, 2014. If you lack a local business structure in the PRC, a Labor Dispatch sales office is a cost-effective answer to your challenge. Essentially, you are renting the services of employees already in China (dispatched to your company) via a Professional Employment Organization like NHGlobalPartners, the leading PEO in China that is fully licensed to do business in China. A PEO can act as your human resources department in China. The PEO is certified in the PRC to address all legal, fiscal and administrative requirements, including visas, payroll administration, expenses management, tax compliance, and health insurance. The presence of the PEO as your subsidiary clears the foreign business of legal hurdles and delays in establishing a presence in China. The company can now run and focus on strategy and marketing without distraction. There is no direct employee relationship to the foreign-owned business that will impact approval to operate. The PEO is your local structure including the rent for the office building you occupy. Labor Dispatch offers the most cost-effective most way to enter the PRC. Your taxes are lower because personnel issues are the burden of your HR department. Even though your outsourcing HR, you retain full control of the company via legal agreement and contract with the PEO. You cannot request a credit bank. You cannot directly invoice for goods, only services. However, the PEO does have the ability to invoice clients based in China or abroad for goods. Onboarding processes vary depending on the dispatched employee’s nationality. If the potential employee is Chinese, it is a bit quicker. However, you can still expect a 1 to 2-month delay in getting new hires in place. Your costs in the PEO endeavor includes the salary of the employees paid through the PEO as well as the cost and fee associated with the PEO contract itself. 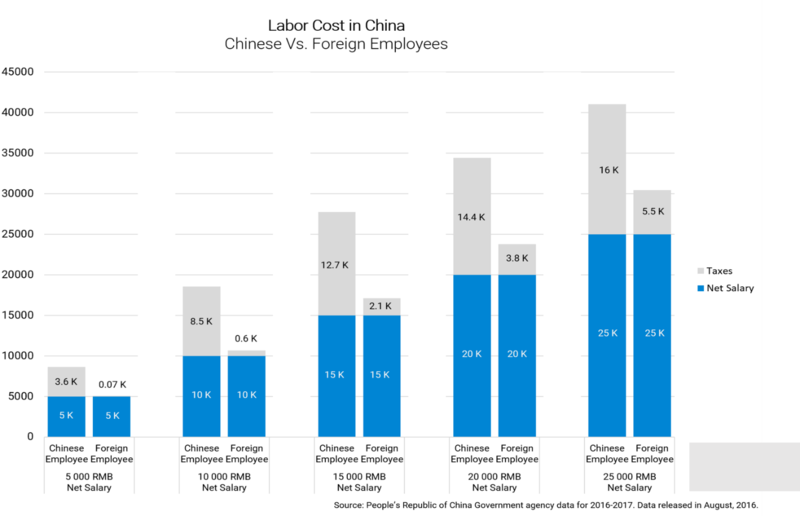 Social insurance of dispatched Chinese new hires is the PEO’s problem but could impact you if the PEO does not handle it correctly. This is an example of where city, provincial and local variations of PRC law hits you hard. Your location is everything. Make sure you’re compliant nationally and locally. Income Tax must be paid by the PEO through withholding and not the employee as is common in most Western companies. If the WFOE manufactures products, it’s called a Manufacturing WFOE. If the WFOE is established to do Consultancy or Service, it’s called a Consultancy (or Service) WFOE. If the WFOE is created to do trading, wholesale, retail or franchising in China, it’s called a Trading WFOE or Foreign-Invested Commercial Enterprise. The term WFOE will do from this point forward since outside of its purpose; they are all governed by the same laws. Take care to ensure the objective of the business is clearly stated in the registration paperwork because if the registration doesn’t say the aim is to manufacture widgets, manufacturing widgets will not be permitted. Companies that are more than 25% controlled by foreign investors is a Foreign Invested Enterprise (FIE) as the Chinese government sees it. A Wholly Foreign Owned Enterprise (WFOE) is most common FIE, which is an LLC form of incorporation. WFOE’s were originally intended to encourage the export of technology-driven manufacturing activities. But, as with most immature business structures, is has been used to set up consulting, and management services companies interested in getting a quick start working the Chinese economy. China’s is still finding its way after entry into the World Trade Organization, and their efforts are what drives rapid changes as the model matures under Chinese law. It is important to note that the capital used by the registered WFOE Company should be solely contributed wholly by foreign investors and not by a WFOE that already has branches established in China. The company can convert with ease earnings from RMB to EUR/USD/etc. The need to develop a local structure in the PRC drives delays and complicates the process because of multiple reviews and agencies to navigate through. Once your business scope is declared, you are limited to that kind of business until you reapply and go through the full WFOE approval process once more. 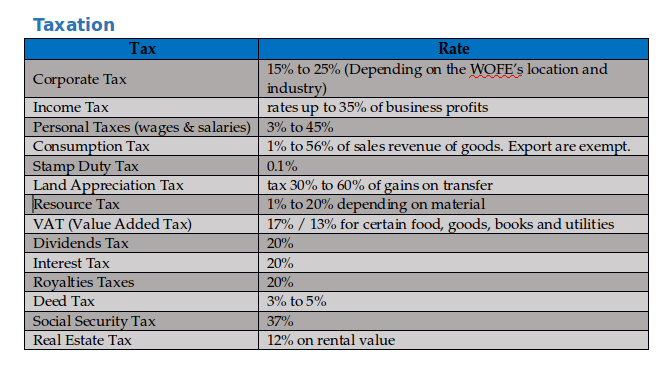 The capital requirements to have on the books in RMB are significant for particular types of WFOE. The company profits are subject to many different taxes such as Value Added Tax, Corporate, Dividend, and Income). The WFOE process can take a full year to complete because very few companies get it right the first time. A perfect package accepted on the first submission by all agencies can reduce that time to six months. Resubmission restarts the clock. A recent change to the PRC WFOE regulation and drops the need for an RMB investment. Thus, no minimum registered capital required for WFOEs whose scope of business is consulting, trading, retailing, or IT is required There is, however, still a minimum amount of registered capital necessary for some industries, such as Banking and Forwarding. The Chinese authorities prefer foreign investors to use this form of company. The intent of the Chinese government is to obtain exposure to advanced technology and new management skills. The foreign investors are then given preference for low labor costs, low production costs, and a potentially significant Chinese market share. If the purpose is to compete against state-owned enterprises (SOE), Joint Ventures are sometimes the only way to register in China to gain a favorable position with the Chinese government. Good examples of candidates for a JV are Restaurants, Bars, Building and Construction, Car Production, Cosmetics, etc. JV’s come in one of two types, an Equity Joint Venture (EJV) or a Cooperative Joint Venture (CJV). An EJV is a Chinese Limited Liability Company (LLC) that partners a Chinese company with a foreign company. Each partner contributes to the project by investing capital. The size of the investment varies based on industry, size, and prior agreements. A CJV is more flexible. The main difference being that in a CJV, the foreign investor may recall its original capital investment before the expiration of the JV. Having guangxi is important in China and is most valuable in a Joint Venture with a Chinese company. Fundamentally guangxi is about building a network of mutually beneficial relationships which can be used for personal and business purposes. Understanding guangxi is imperative as many Western cultures don’t include social practice as part of their business relationships. In China, it is necessary to spend time getting to know the Chinese counterparts outside the boardroom during tea sessions and dinner banquets. Benefit from the partners’ already established “Guangxi” or social business network. It can be difficult to work together- the two parties may have different goals in mind. The time to accomplish setting up a JV can vary depending on how quickly a partner can be found, and a formal contractual agreement can be negotiated. Industry practice suggests taking at least a year to provide ample time to identify a partner, perform due diligence, and discuss terms with them. Duration can also be extended depending on which JV format was chosen. Creating a legally separate entity takes the most time as a WFOE is mostly being formed. That could add up to a year to the process. Cost depends on the agreements reached by the two parties and which type of JV was chosen. The first format listed, forming a separate legal entity is the most expensive since a WFOE is being created from the ground up. It is mandatory in the PRC to use a local legal consultant to draft the JV agreement which will add to the final costs of setting up the JV. Essentially, a WFOE is being set up as a Joint Venture with a Chinese company, so the tax structure on the JV is the same as the WFOE. A Representative Office (RO) is a legal entity that represents a foreign company in China. Its purpose is to engage in quality control, marketing, lead generation, creating a business network, market research, etc. It is commonly used to “test the waters” in China. The expenses are primarily administrative, such as office rental, salaries, insurance, etc. It cannot hire Chinese nationals directly. It must go through an HR firm or partner with a PEO. It must be located in mandated government buildings in particular cities. It is primarily administrative, and it depends on which city the company wants to locate in. It also depends on how many employees are planning to be hired. A fair estimation would be 15,000 USD for monthly operational costs. It is one of the quickest ways to enter the Chinese market as it only takes a few months to register and establish a Representative Office completely. There are fewer taxes with this setup as there are no corporate or dividend taxes. There are many ways to enter the Chinese market as we have demonstrated. It is recommended that careful consideration is given to all options before making the final decision. A wrong decision made may harm the viability of the business in China and lead to a poor reputation with the various Chinese governmental agencies. It is recommended that a professional consultancy is contacted to ensure all possibilities are discovered and professionally analyzed for applicability to the business.